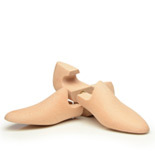 For the best results place shoe trees inside your warm and humid footwear, right after taking it off. Sophisticated shoe trees are crafted from high-quality wood and will maintain your footwear’s shape, straighten creases in the leather upper and enhance the drying process. 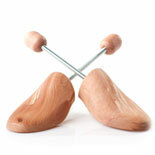 Today, shoe trees come in numerous shapes and sizes, and finding the right fit for your shoes is vital. Screw shoe tree with fold-down handle, crafted from cedar wood. Easy to use, made of beautiful beech wood. Spring-loaded shoe tree, crafted from the aromatic cedar wood. Classic spiral shoe tree, crafted from high quality beech wood. Available in three lengths, these boot trees preserve boot shape. 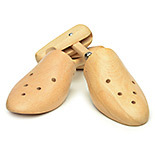 Classic women’s shoe tree made of high-quality beech wood. Specially created for high heels. Made of beech wood, easy to use. When shoes are not worn for a long time they can easily lose their shape. A shoe tree is a fantastic way to preserve your shoes’ original lines and keep them dry and odour-free. Shoes are manufactured on a so-called shoe last, which represents the human foot’s anatomy and provides the structure necessary for each shoe as it is being made. During the day, our feet fill our shoes and perform the same task, maintaining our footwear’s shape. 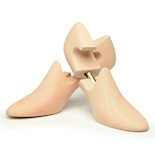 After usage then, it is advisable to have a tool to do exactly the same – and that is where shoe trees come in. 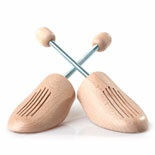 Shoe trees stabilise the shoe’s structure, just like a last, and help take care of their shape every single day. There are numerous shoe trees out there and all claim to be the best. But how do you recognise a good one? The answer is simple: Quality materials and a perfect fit are what make the difference. Wooden shoe trees are much better than their synthetic cousins – they radiate a pleasant odour, fit the shoe perfectly and promise a shorter drying time. Wooden shoe trees also fill out the shoe’s whole vamp, while the end fits snugly in the counter cap – just avoid over-flexing the shoe tree. A final tip: a wider heelpiece is much better than a thinner one, because it spreads the pressure out better and avoids any damage to the vamp. 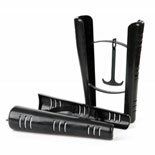 Every shoe tree consists of three parts: The front piece fills the shoe’s toe cap, the heelpiece adjoins the counter cap and the middle piece is a connecting spring. 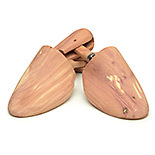 Discerning shoe lovers might opt for wooden shoe trees with a fold-down handle. The front piece is connected to the heelpiece by a metal shaft, which is adjustable in length, slope and pressure. While quality materials are important, it is great fit that separates good shoe trees from bad. Front piece and counter cap should replicate the shape of your footwear, while the shoe tree needs to fill the shoe’s whole volume. A smaller, bigger or sharper counter cap will damage the condition of your footwear. Surprisingly, many wearers believe their footwear has to cool down first, before they can place a shoe tree inside. That is, in fact, incorrect. For the best results, a shoe tree should be placed into still-warm footwear. Possible creases are easily straightened out and the original shape is maintained. A high-quality shoe tree also stabilises the inner’s construction, eliminates odour and reduces the drying time of your footwear.